At the last stations of the cross, we pray in sorrow but also in hope through the thirteenth and fourteenth stations. When the soldiers came to Jesus, they saw that He was already dead so that they did not break His legs, but one of them opened His side with a lance, and immediately there came out Blood and Water. The body of Jesus was then taken down from the Cross and laid in the arms of His sorrowful mother. Taking the body of Jesus, Joseph wrapped it in fresh linen and laid it in his own new tomb that had been hewn from a formation of rock. Then he rolled a huge stone across the entrance of the tomb and went away. Proceeds from the sale of the book go to the Garden of Mercy at Divine Mercy Catholic Church in Faribault. As we journey to the Passion, walk with Jesus through the ninth and tenth stations. Jesus falls the third time. Exhausted by carrying his cross – carrying our sins and failures – Jesus experiences the burden of the heavy cross. When they reached the place called Golgotha which means skull, they offered Him wine mixed with gall. Jesus tasted it but would not take it. His blood dripped as His sticking wounds opened when they tore off His clothes. Meditate slowly on the stations seven and eight. Again, under the weight of the cross Jesus falls to the pavement. His pain and suffering we cannot fathom. I think I am following your will does not mean that I am actually doing so. Lord, human love helps me to understand divine love. gives us a glimpse of the love of God for man. but it must be sustained by an effort of the will. It must lie still and quiet, dull and smoldering, for periods. It grows through suffering and patience and compassion. we must even take upon ourselves the penalties due their sins. Thus we learn to understand the love of God for His creatures. Thus we understand the crucifixion. Walk with Jesus and meditate on the fifth and sixth stations today as we journey toward the Passion. On their way out they met a Cyrenian named Simon; this man they pressed into service to carry the cross. 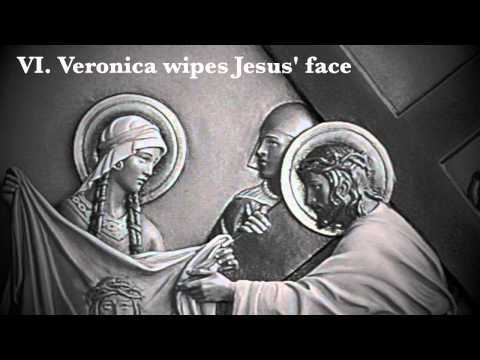 Veronica hastily went near Jesus and wiped His face with a piece of cloth. The face of Jesus was imprinted in the cloth. Continue your journey to the passion and slowly meditate on the Third and Fourth Stations of the Cross. Weakened, prodded, cursed, and fallen, His whole Body bruised and swollen, Jesus tripped and lay in pain because of our sins. Dust and blood were seen in His Holy Face when He looked up to heaven asking God the Father to let Him redeem us sinners. I cast myself at your feet, that you may renew my strength and my courage, while I rest here in your Presence. I wish to live in you; suffer and die in you. at the hour of my death, be my hope and my refuge. Amen. There on the road to Calvary, Jesus met His afflicted Mother. They looked at each other’s teary eyes. Oh, what sadness our loving Virgin Mother felt in meeting her suffering Son; truly, a sword pierced her heart. pure and transparent as a spring. A faithful, generous heart that forgets no favor and holds no grudge. Give me a humble, gentle heart. A heart tortured by its desire for the glory of Jesus Christ. With a wound that will heal only in heaven. Amen.